What Is The Horse Freeze Branding Process? Below are photos of horse freeze brands. The photos show freeze brands in various stages, from moments after the horse was branded up to three months later. Even though some of the information on this page is fairly detailed it is not intended to be a how-to article on freeze branding. It is simply intended to be general information describing items and techniques commonly used in freeze branding, and to show pictures of freeze brands on horses at different stages. We have a related page with basic information on what freeze branding is and what it's useful for. You can see it here: What Is Freeze Branding? Below: A freeze brand on the right hip of a horse. Dry ice, about 4.5 pounds. Heavy gloves for handling the dry ice, the coolant mixture, and the chilled freeze branding iron. Electric animal clippers with a #10 blade and a #40 surgical blade. Wrist watch with built-in stopwatch, or a stopwatch. Styrofoam cooler to transport the dry ice. 99% alcohol, 1 quart, for soaking the horses' skin. A hammer for pounding the block of dry ice into smaller pieces. Safety glasses to wear when pounding on the dry ice and while branding. An older, expendable plastic cooler for holding the dry ice / acetone mixture. NOTE: While the plastic cooler shown in the photo below survived just fine, we have heard that a plastic cooler cannot withstand the extreme cold of the coolant mixture and will crack. NOTE: While dry ice and 99% alcohol can be used with a Styrofoam cooler, dry ice and acetone cannot; the acetone will dissolve the Styrofoam. See the photo toward the bottom of this page. Freeze branding requires that all hair be removed from the branding site so that the extreme cold of the freeze branding iron can be applied directly to the skin. 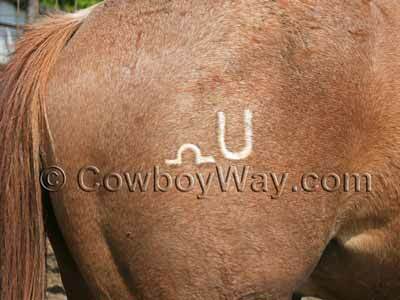 In the photo below you can see the branding site on one of the horses, the right hip, was shaved. The area is a little bigger than the actual brand, and an effort was made to make the bottom edge level to use as a guide when applying the branding iron. A #10 blade was used first to remove a heavy layer of winter hair, followed by a #40 surgical blade to clip down to the skin. 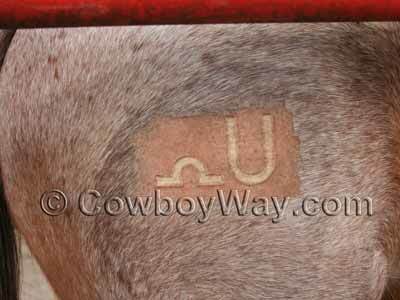 Below: The shaved freeze branding site on a horse. After the horses were clipped a block of dry ice was broken into golf-ball size pieces with a hammer, then mixed with acetone in a plastic cooler to form the coolant. Note: We strongly recommend wearing goggle or other protective eyewear when breaking up dry ice and/or freeze branding. Approximately 4.5 pounds of dry ice and 2/3 of a gallon of acetone were used to make the mixture shown below. This was enough dry ice to cover the bottom of the cooler and enough acetone to cover the head of the branding iron by about one inch. 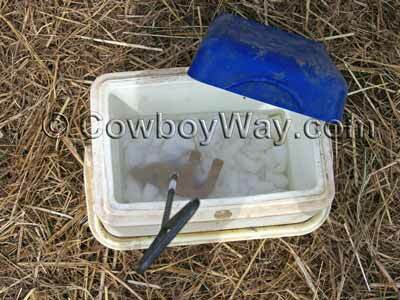 Below: A plastic cooler holding a mixture of dry and acetone, and a freeze branding iron. When dry ice and acetone are first combined the mixture will bubble and release a foggy vapor, but will settle down to became still and clear when the mixture has chilled. When the coolant settles the freeze branding iron can be added. After each animal is branded the freeze branding iron will need to be put back into the coolant and re-chilled. After clipping the branding sites and chilling the branding iron, a hole was made in the cap of a quart bottle of 99% alcohol. The first horse to be branded was led into a pipe alleyway and his skin at the branding site was liberally squirted / soaked with the alcohol. The freeze branding iron was applied IMMEDIATELY after the alcohol soak. Below: Soaking the branding site with 99% alcohol. IMMEDIATELY after soaking the freeze branding site with 99% alcohol the freeze branding iron was applied. The iron was applied to the branding site with firm pressure and a gentle rocking motion from side-to-side and top-to-bottom. The amount of time a horse (or other animal) should be freeze branded will vary according its age, the type of metal the branding iron is made of, the type of coolant being used, and other factors. Sorry, we don't have a photo of the actual branding. There were just two people present and one was branding while the other one watched the stopwatch. When the branding time was up the freeze branding iron was removed from the horse's skin. Within seconds after freeze branding an indentation of the brand should be easily visible. The photo below was taken immediately after the freeze branding iron was removed. The indented outline is larger than than the actual size the completed brand will be. Below: A freeze brand moments after the branding iron was removed. Approximately five to ten minutes after branding the indentation that was first visible will begin to disappear and be replaced by a swollen, puffy outline of the brand. 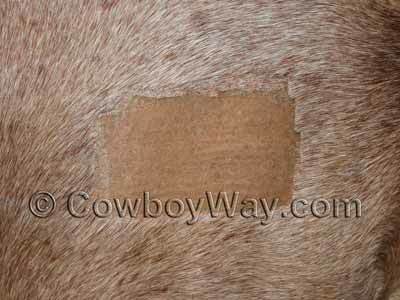 The photo below was taken 40 minutes after the horse was freeze branded and the puffy outline is clearly visible. Like the indented outline in the photo above, the puffy outline is larger than the actual size the completed brand will be. Below: A 40-minute old freeze brand. Within two or three days after freeze branding the brand will lose its swollen, puffy appearance. 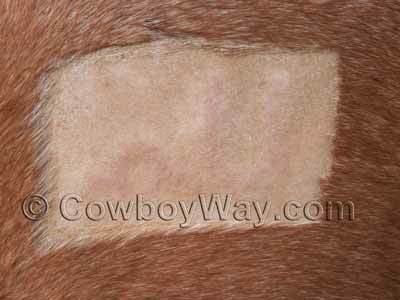 The photo below was taken 25 hours after the horse was branded and the puffy outline has already diminished greatly. Below: A 25-hour old freeze brand. Several days after freeze branding the brand may be difficult to see, and/or the branded skin may have a flaky or scaly appearance. The brand is likely to go through various stages of flaking or scaling until new hair starts to grow back in, approximately 30 days after branding. The photo below was taken 15 days after branding. Below: A 15-day old freeze brand. About three months after freeze branding new hair growth should be complete or close to complete. The photo below was taken three months and six days after the horse was freeze branded. You can see that the hair where the freeze branding iron was applied grew in a nice, bright white. Below: A three-month old freeze brand. Many states have laws regarding branding livestock and/or other animals. If you are considering freeze branding, check with your state for any laws that may apply to branding and/or to registering a brand where you live. The horses in the photos on this page were branded with a coolant mixture of dry ice and acetone. Other common coolants used for freeze branding are dry ice and 99% alcohol, and liquid nitrogen. A Styrofoam cooler has long been a staple in freeze branding for holding a coolant mixture of dry ice and 99% alcohol. However, if you are using dry ice and acetone you cannot use Styrofoam since acetone will dissolve it on contact. 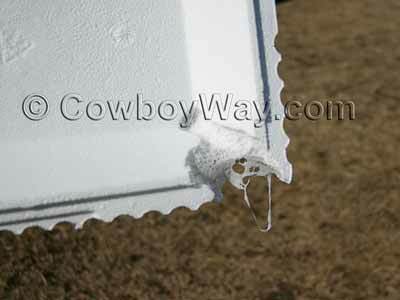 The photo below shows what happens when even a small amount of acetone comes into contact with Styrofoam. 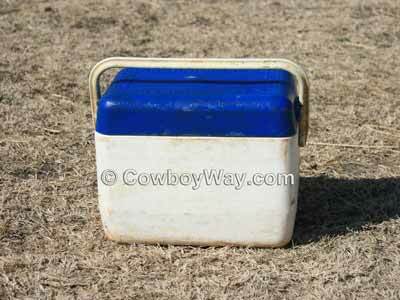 Below: A Styrofoam cooler that has come into contact with acetone. The alcohol used in freeze branding needs to be 99% alcohol. This applies to the alcohol used to soak the skin of the animal immediately prior to branding, and the alcohol used to combine with dry ice to make the coolant for the branding iron. Lower percentages of alcohol contain water that can cause a thin layer of ice to form when freeze branding, decreasing the penetration of cold into the skin. While 99% alcohol was readily available in years past it can now sometimes be difficult to find, especially in larger quantities such as gallons. This is why acetone is often used instead of 99% alcohol to mix with dry ice to make the coolant. However, 99% alcohol is still needed to put on the skin of the horse (or other animal) immediately before applying the freeze branding iron. 99% alcohol can often be found through a local veterinarian or pharmacy, but it might not be in stock and may need to be ordered. It can also often be found for sale on various websites. If you are freeze branding, heavy gloves, a shirt with long sleeves, and long pants (as opposed to shorts) should be worn when handling dry ice and/or any coolant. It's also a good idea to wear safety glasses when breaking up the dry ice and when branding. 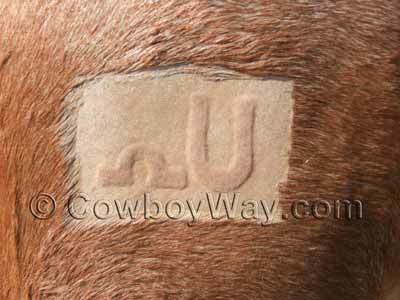 The amount of time a freeze branding iron should be applied to a horse (or other animal) varies according to the type of animal, its age, the type of coolant used, the type of metal the branding iron is made of, and other factors. If you are considering freeze branding and need suggested branding times, consult with someone experienced with freeze branding and/or the manufacturer of the branding iron you will be using. If you're curious, for the finished freeze brand shown above the horse was a three-year old red roan gelding, the coolant used was dry ice and acetone, the freeze branding iron was made by L & H, and the freeze branding iron was applied for 24 seconds. It is not uncommon to sedate a horse during the freeze branding procedure. Sedation helps to insure the horse holds very still while the freeze branding iron is applied, which greatly helps the brander to apply the firm, consistent pressure that results in a clear brand. Sedating a horse also helps to minimize concerns some horse owners feel about their horse experiencing pain while being freeze branded. However, sedation always carries a few risks. If you are considering sedating a horse for freeze branding, consult a veterinarian experienced both with horses and freeze branding for their opinion. Here is an interesting article about freeze branding dogs: http://www.coondawgs.com/freezebrand.html (<<<this link will open in a new window). http://dryicenetwork.com and http://www.dryiceinfo.com (<<<these links will open in a new window)..
For text and photos on what freeze branding is and what it's useful for, please see this page: What is Freeze Branding? 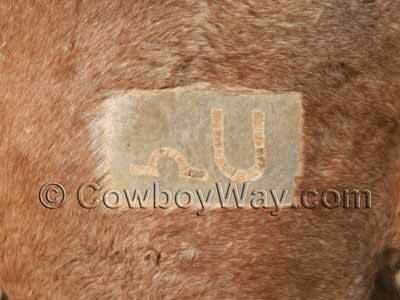 Are your horses freeze branded? Why or why not?